Mobile carrier T-Mobile reportedly leaked a photo of a new Windows 10 phone with VR capability earlier this week during Microsoft’s Windows 10 event in New York. The phone is an Alcatel Idol 4S, and ships with a VR headset similar to what Microsoft was referring to at the event itself. The event saw Microsoft talk about a new line of VR headsets from its device manufacturing partners specifically for smartphones running on Windows 10 Mobile. The retail price was announced at $299, making it much more affordable than the $3,000 that HoloLens Development Edition currently retails for. Of course, these cheaper ones aren’t Microsoft-branded, but they’re designed to integrate well with holographic and mixed reality apps on Windows Store. 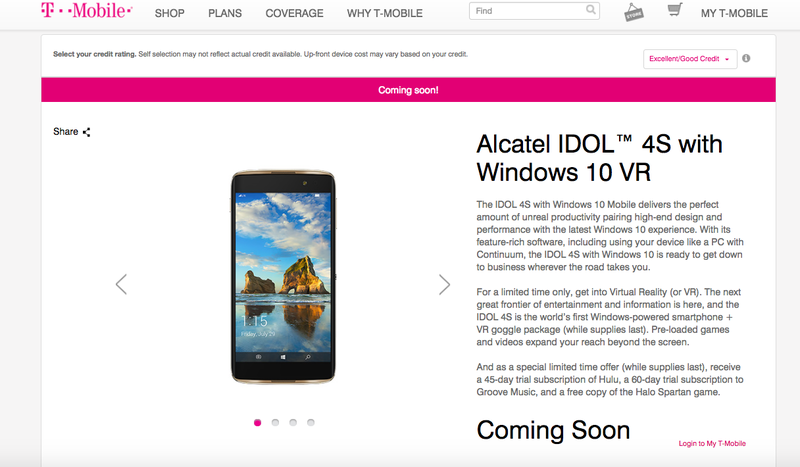 The Alcatel from T-Mobile is reportedly the first Windows-powered phone that comes with VR goggles, according to the page that was up on T-Mobile’s website about three days ago. While the phone is geared for entertainment, it obviously comes pre-loaded with all the typical Windows 10 goodies. Except, this time they’re on a phone version, which will be interesting to see. T-Mobile also opened up a limited offer where the first few buyers will get a free 60-day trial subscription to Groove Music, a 45-day trial of Hulu and also a free copy of the game Halo Spartan. Microsoft has been pushing its augmented reality capabilities in a big way to enterprise customers with the Development Edition and Commercial Suite version of HoloLens, the second of which retails for $5,000. On the consumer side of things it’s obviously decided to partner with smartphone manufacturers and get third-party VR headset makers to join the game so they can get it down to a more consumer-centric pricing. The price point of VR headsets is a big worry for most consumers because, frankly, a few thousand dollars for a VR or holographic experience isn’t what you would normally consider a pocket-friendly product. As a result, Microsoft is taking the partnership route so consumers can enjoy the immersive experience of Windows Holographic and Windows Mixed Reality. Of course, the content is important here so, apart from the Alcatel version from T-Mobile, most of the upcoming Windows 10 Mobile smartphones will ideally come pre-loaded with VR videos and gaming content. Other known Microsoft partners in this endeavor are Acer and Asus, who have partnered with vendors for their VR headsets. But essentially, these are all being seen as Microsoft’s line of VR products, which makes sense since they’ll be compatible with relevant apps on Windows Store.